While points-earning debit cards are few and far between – and getting rarer by the day! – there are still some out there that offer a good alternative to getting a credit card if you want to maximize your miles. I can’t value travel credit cards and the points they can earn you enough, but if you do not have a stellar credit score or you worry about spending money that you don’t have and accruing big balances, then a debit card can be a safer and easier option since unlike credit and charge cards which will let you run up huge balances, debit cards will generally only let you spend the money you have in the bank – with some allowing modest over-drafting (at high fees, of course). As I have explained in the past, debit cards used to be a lucrative way to rack up points but the Dodd-Frank act has made miles- and points-earning debit cards a lot scarcer. One option that seemed too good to be true but actually lived up to its lofty promises was from PerkStreet Financial, which offered a no-fee debit card and checking account. This card didn’t earn miles, but instead gave up to 2 percent cash back per every dollar spent (non-ATM), so you could use the cash back in the form of statement credits to buy any travel reward – or anything else – that you might want. Unfortunately, PerkStreet told its customers on Monday that it is going out of business. Their money is safe and they will continue to be able to access their funds, use their debit cards and write checks through the Bancorp Bank, but sadly the company will cease all business operations on September 26, 2013. My Continental Airlines debit card is a plastic slice of history. The loss of PerkStreet to the banking market is the latest demise of a points-earning debit card. 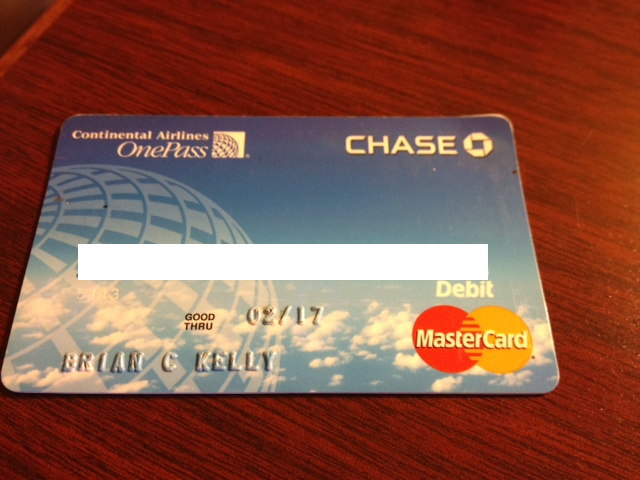 In July 2011, we saw Continental discontinue all mileage earning on their Chase debit cards and most other mileage debit card programs, although I do still have a Continental Airlines debit card from Chase in my wallet for nostalgic reasons! Luckily it is not all doom and gloom and there are still some profitable debit cards out there, which I will detail below. Suntrust issues the Delta SkyMiles debit card. Delta SkyMiles World Check Card from Suntrust: Suntrust has the Delta SkyMiles World Check Card, which currently has a bonus of 5,000 bonus miles after your first qualified purchase to be used for vacations, upgrades or for Delta Sky Club Memberships. Along with building up your miles with the typical credit card purchases such as groceries, gas or dining, you can also earn or payments on monthly bills such as car insurance and utilities. I also used this card for my tax payments and got miles for the purchase- even though the charges went through as debit transactions so I only paid the $3.49 fee per transaction instead of the ~2% that most processors charge for credit transactions. To apply for the card, you must have one of the following Suntrust bank accounts – either Solid Choice Banking, Signature Advantage Banking or Balanced Banking. If you already have a qualified account, call 800-SunTrust to upgrade to a Delta SkyMiles Check Card. Check out this post on Maximizing the Delta Suntrust Debit Card for more details. The Bank of America Alaska Airlines Debit Card is still available. Alaska Airlines Debit Card from Bank of America: There has been talk of Bank of America discontinuing the Alaska Airlines debit card, however I spoke with customer service representatives at both Alaska and B of A who told me that it is still available, although not widely promoted. You can apply for the card on the Bank of America website if you have a checking account with B of A, but for full details you need to go into a branch and talk to a banker. Unlike with co-branded credit cards, with this debit card, your Alaska Airlines miles do not post after your monthly checking account statement closes and instead appear at the beginning of the following month. Also note that Bank of America does not award miles based on tax payments you make with your debit card – so that method of racking them up is out of the question with this particular card. The 1 point per $2 earning rate on this card isn’t so great, and you might be thinking that Alaska miles aren’t useful for you, but keep in mind they have several great airline partners including American and Delta, not to mention Emirates, British Airways, Air France, Cathay, Korean Air, Qantas and more, so you should be able to put the miles you earn to good use if you can rack up enough. Hawaiian Airlines Visa Check Card from Bank of Hawaii: The Bank of Hawaii also has a points-earning check card if you have an account with them, for a monthly fee of $3. Miles are earned on the first $5000 in qualifying purchases each month and are capped at 2,500 miles. Earn up to 10 additional HawaiianMiles per dollar when you use your Bank of Hawaii Hawaiian Airlines VisaCheck Card at any participating HawaiianMiles XtraMiles Partner on qualified purchases. Note that you can not earn miles on ATM transfers or withdrawals of cash or cash equivalents, cash advances, purchases of traveler’s cheques or other equivalents. Purchases made using the ‘debit’ function of a merchant terminal do not earn HawaiianMiles either. Although you might not fly out to the islands much, Hawaiian Airlines partners with great airlines like ANA, American, JetBlue, Virgin America and Virgin Atlantic among others. As I mentioned above, many people prefer the simplicity of debit cards. For one, you don’t need to have good credit to get a debit card – the bank will simply run a soft inquiry on you to make sure the information you provide is correct. There are strict laws that banks need to “know their customers” due to anti-money laundering and terrorism, but these soft inquiries will not affect your FICO score. Even in the age of countless huge credit card companies, there are still many things that a debit card is better equipped for. The other thing about getting a miles-earning debit card that might make it an attractive choice is that you can pay your taxes with it and only incur fees that are nominal compared to those that are charged when you use a credit card to pay your taxes. Business Tax Payment: 2.35% fee when using credit cards or a flat fee of $2.99 when using a debit card. So on a $10,000 tax bill, that can mean the difference between paying $2.99 and paying $235. Just be sure to verify with your bank that you will earn miles on this transaction since some, like Bank of America, do not qualify these transactions for mileage accrual. The Amex Bluebird is a versatile checking account and debit card alternative with which you can set up direct deposit and bill pay to help manage your finances and cut checks, as well as using the card at ATM’s or on purchases. Basically the same functions as a checking account without any credit inquiry, annual fees, or minimum balance requirements, and it’s got tons of functionality. Even better, you can fund it using Vanilla Reloads, which you can purchase from stores like CVS using a credit card, and then use the card like a debit card to withdraw cash from ATM’s, but also to pay bills through its electronic Bill Pay system (you can send money to whomever you like – you just need a name and address) or even cut paper checks from your account. Just keep in mind that Bluebird does have its limits, including a daily Vanilla Reload limit of $1,000 and $5,000 per month, so I’d highly recommend reading through the Bluebird’s fee and limits chart on the main website and the official Bluebird member agreement. If you do have a miles-earning debit card, though, you should still keep a product like Bluebird in mind. That’s because many stores are now requiring customers to buy reload cards like Vanilla Reloads or Green Dot MoneyPaks using either cash or a debit card. With a debit card you circumvent that problem and you can fund your checking account from your checking/debit alternative account. You will still have to have the money to back up those purchases in your account, but if it makes sense to use some of Bluebird’s functions instead of those of your debit card, such as the easy Bill Pay interface.